I noticed over the weekend that Robert Orlando’s much discussed 89-minute documentary Apostle Paul: A Polite Bribe is now available for purchase on DVD or download. I’ve now watched it and was impressed by the number and names of the scholars interviewd in the film. I also enjoyed that the documentary sought both to persuade the viewer of a particular political function for the Jerusalem collection while also providing a decent (if not one-sided) summary of Paul’s life and ministry in the process, which gave the historical survey lying at the center of the film a sense of unity from beginning to end. The film certainly has an agenda to push, and I myself was not convinced, as the film suggests, that the Jerusalem collection was a failure, in that James ultimately rejected the Gentiles’ money and Paul’s Gentile mission. Unlike the director and the interviewees given prominence toward the end of the film (where Wright, Witherington, and Hurtado seems to disappear), I find no reason to believe that James and the Jerusalem believers conspired against Paul and somehow actively or passively contributed in his beating and arrest in Acts 21. Luke explains that Paul was welcomed gladly by James and company when Paul arrived in Jerusalem (Acts 21:17-26) and I find no reason to doubt the veracity of that account. Whatever the case, Orlando’s film is worth watching and reflecting upon critically critically. This could be a good documentary to show students of early Christianity, though afterward one should given plenty of time for class interaction and for fielding questions. I try daily to read the Deutsche Welle news to keep up with my German. Another benefit of this news source is that it is much more balanced in its discussion of key world events than the normal US news. They’ve been following a story of late that in Germany if you don’ t pay your church tax, the Catholic church has decided that you are not a faithful member of the church and should therefore have privileges like participating in communion curtailed. As a good baptist (though I’m probably only a baptist as much as Olive Garden is Italian) I like the separation of church and state, in distinction to the recent baptist resurgence has led in the exact opposite direction from its roots. At any rate, the question of financial participation as being a requirement for participation in the sacrament reminds me of questions that were raised a few hundred years back by a German monk. No doubt, this is much different than the indulgence question and I think that giving to the church is very important, but should the church bar those from the eucharist for not paying a tithe? I’m sure many baptists would argue yes, though the Supper doesn’t mean enough for them to matter. I don’t want this to sound anti-catholic, because many of my students accuse me of falling on Catholic (and Orthodox) sides of issues as much as Protestant. I imagine the Evangelische Kirche will have similar problems. Also, should a civil court make the decision? How would they enforce it? Die katholische Kirche schließt Menschen, die keine Kirchensteuer zahlen, auch aus dem kirchlichen Leben aus. Kann man aus der Kirche austreten und trotzdem katholisch sein? Darüber entscheidet nun ein Gericht. Das Bundesverwaltungsgericht in Leipzig trifft am heutigen Mittwoch eine Grundsatzentscheidung zur Kirchensteuer in Deutschland. Es geht um die Frage, ob man sich von der Zahlung der Kirchensteuer befreien, gleichzeitig aber Mitglied der katholischen Kirche bleiben kann. Der Freiburger Kirchenrechtler Hartmut Zapp hatte 2007 seinen Austritt aus der Kirche als Körperschaft des öffentlichen Rechts erklärt und keine Kirchensteuern mehr gezahlt. Er erklärte jedoch, er sei weiterhin gläubiges Mitglied der Kirche. Dagegen hatte das Erzbistum Freiburg geklagt. Zapp erhielt mit seiner Klage in erster Instanz recht. Der Verwaltungsgerichtshof Baden-Württemberg in Mannheim entschied aber, dass es keinen teilweisen Kirchenaustritt geben kann. Dagegen hatte Zapp Revision eingelegt. 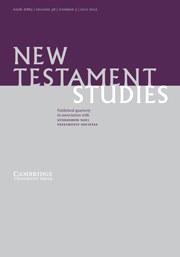 The fact that many of the initial German members of the Studiorum Novi Testamenti Societas were also supporters of the NS regime and among the authors of scholarly antisemitism (G. Kittel, K. G. Kuhn, W. Grundmann) is one that requires proper examination. This paper uses relevant archival material, such as previously unexplored documents from the Reich Ministry of Education (Reichserziehungsministerium), to explain this perceived link, demonstrating how Professor Gerhard Kittel (1888-1948) from Tübingen used his political power to control the selection of the first German scholars in the Society. John Barclay gave a paper on Monday evening at the NT Seminar about how the bible was used in the british abolitionist movement which came to fruition in laws passed in 1807 and 1834. You can read the full version in the most recent, I believe, copy of Expository Times. He focused on the dual influence of enlightenment moral philosophy and biblical themes. The interesting item of note is that on the surface one can make a surprisingly strong argument for slavery based on biblical texts (e.g., Leviticus 25). However, John noted strongly that a key influence in the application of biblical texts against slavery was the enlightenment moral philosophy with its emphasis on universal rights that allowed abolitionists to reframe slaves as ‘men’ and even more importantly ‘brothers’. Accordingly, all the texts on how to treat one’s brother in the bible became relevant to all people regardless of race. It does make one think about how strongly our current worldview determines our ability to interpret the bible. It also shows how much evangelicalism in the UK has a different DNA in many ways than that of the US. In the UK evangelicals were (and are?) very active in social issues, and were the main movers for social change. On the other hand, evangelicals in the US regularly toy with isolation from society rather than positive engagement. One item to note is that along with William Wilberforce, Granville Sharp was a key player in the abolitionist movement. And as Dan Wallace will tell you, he also wrote an essay on taxation without representation, which also proved influential in a small conflict around 1776. So he had three very influential essays in very different areas: abolition, taxation, and Greek grammar. US Republican Debate: We obviously don’t get too much news on the 2008 election cycle here since the shake out of the main candidates has yet to occur–though they did cover the actual results of the mid-term elections quite a lot. A week or two ago (I forgot to blog about it then) I saw a debate between the Republican hopefuls on Fox. Maybe it’s because they’re from my part of the country, but I thought Ron Paul and Mike Huckabee came off pretty well. I like Paul’s view of the government, but from the little I’ve seen, he doesn’t get much air time. UK: In the north east, the Labour (left) and Liberal Democrats (centre-left) took all the votes in the most recent local elections, and the Conservatives (aka Torries) didn’t take any. From what I hear it dates back to when Margaret Thatcher (Conservative) shut down the mining operations. Around here, the LD’s hold a majority in the city council and the L’s hold a majority in the county council. Our pastor said that the (mining) labour unions also had quite a connection with the Methodists over the last couple of centuries, such that the local union banners were hung inside the chapels. But that obviously has changed. As a bit of history, the LD’s broke off from the Labour party b/c they thought it was becoming too left wing. In national elections, the LD seems to always run a distant 3rd. Labour has held the power for the past 12 years or so at least with Tony Blair as Prime Minister. Gordon Brown (Labour) has been tapped to replace Blair next month as PM.